Blog ››› September 15, 2016 11:24 AM EDT ››› CRISTINA LóPEZ G.
Every year from September 15 to October 15, people in the United States celebrate Hispanic Heritage Month, honoring the contributions of the Hispanic community and celebrating its history, heritage, and culture. Fox News in the past has paid lip service to Hispanic Heritage Month, but the network has consistently failed to curb its typical disparaging and vitriolic rhetoric against this community, making any segment aired to honor Latinos read like a transparent PR ploy. Fox News has also reliably defended Republican presidential nominee Donald Trump’s attacks on Latinos, including his claims that Mexican immigrants are criminals and that a judge of Mexican heritage could not impartially preside over a lawsuit against him. And the network regularly features anti-immigrant programming and excludes Latino voices. 1. Fox’s Sean Hannity: “I Agree With Mr. Trump” That Mexicans Are Criminals. Sean Hannity defended Trump’s assertion that Mexico is sending “rapists” and “criminals” to the U.S. during a June 29, 2015, panel discussion. Hannity said, "I agree with Mr. Trump. As somebody who has been down to the border 11 times, I have seen the drug warehouses, I was there when criminals were arrested, I know the human trafficking side and the impact on our educational system, criminal justice system, et cetera -- our health care system. 2. Fox's Brian Kilmeade Has Repeatedly Criticized Use Of Spanish Language. 3. Fox Chose Not To Air The Speeches By Latinas In Favor Of Immigration Reform During The Democratic National Convention. On July 25, the Democratic National Convention featured a speech by 11-year-old Karla Ortiz, an 11-year-old American citizen who relayed her fears that her undocumented parents may be deported. Ortiz said, “I’m scared that at any moment my mom and my dad will be forced to leave.” Ortiz also translated for her mother, Francisca, who said that Democratic presidential nominee Hillary Clinton will fight for people like her. On the same night, DREAMer Astrid Silva -- who came into the country undocumented but whose deportation was deferred under President Obama’s Deferred Action for Childhood Arrivals (DACA) program -- described growing up in the United States without legal status. Fox chose not to show either of the speeches. 4. Fox Marginalized Hispanic Voices In Discussions Of The Orlando Massacre, Even Though A Majority Of The Victims Were Latinos. 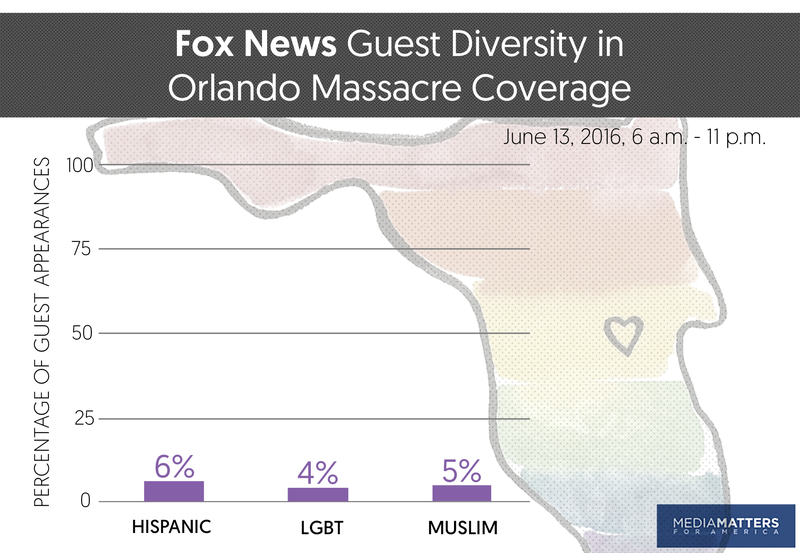 A Media Matters study of the three major cable news networks’ coverage of the massacre that took place in an LGBT nightclub in Orlando, FL, on June 12 found that Fox featured the least diverse guests discussing the attack. Out of a total of 80 guests invited to comment on the massacre during the period analyzed, only 6 percent were Hispanic, even though the tragic events disproportionately affected the Latino community. 5. Fox’s Sunday Political News Show Did Not Host A Latina Guest For Three Years. A 2016 Media Matters study of guest appearances on the five network and cable Sunday morning political shows found that Fox’s show, Fox News Sunday, did not host a single Latina in three years. Based on the latest U.S. Census data, Latinas make up 9 percent of the general population in the U.S. Sunday political talk shows often set the media and political agenda, and Fox did not see fit to include Latina voices in that process, even though 2015 saw numerous pressing policy issues that disproportionately affect them, such as attempts to block access to reproductive health services, efforts to defund Planned Parenthood, and continued wage gaps between genders. 6. Fox Analyst Lectured Young Latino Protesters On How To Protest Like Americans. 8. Fox’s Neil Cavuto Asked Anti-Immigrant Sheriff Joe Arpaio For Advice On Republican Latino Outreach. 10. Fox’s Bill O’Reilly Joined Trump In Suggesting Judge Overseeing Trump University Case Should Recuse Himself Due To His Ethnicity. Fox’s Bill O’Reilly agreed with Trump’s statement that federal Judge Gonzalo Curiel -- who is overseeing the Trump University case -- could not objectively do his job because of his Hispanic ethnicity. During his June 7 show on Fox, The O’Reilly Factor, O’Reilly suggested that Trump’s “strong stand against illegal immigration” and “border wall” were valid reasons to believe a Hispanic judge could be biased against him. 11. Fox Was The Only Cable News Network To Ignore The Racist Attacks Trump Supporters Launched Against A Hispanic Journalist. On September 12, Cleveland.com’s senior political writer Henry Gomez reported on the racist “vitriol” he has fielded while covering the 2016 presidential election, writing that most attacks were “parroting a lot of Donald Trump’s greatest hits.” Both CNN and MSNBC invited Gomez on as a guest to share his experience on September 13, yet Fox ignored his story. 12. Fox’s Sean Hannity Joined Trump In Anti-Immigrant Fearmongering For Two Hours Of His Show. Sean Hannity hosted a town hall for Trump devoted to anti-immigrant fearmongering, and he dedicated two hours of his prime-time show Hannity on August 23 and 24 to airing it in full. The town hall served as an immigrant-bashing forum during which Hannity misinformed on crime and immigration and fearmongered about the “absolutely staggering” effects of undocumented immigration on the U.S. According to Pew, a large percentage of the undocumented population is comprised of Latinos. Blog ››› August 8, 2016 1:58 PM EDT ››› CRISTINA LóPEZ G.
TUCKER CARLSON (CO-HOST): So of all the many ironies baked into this, the one that amused me the most was Hillary accusing her opponent of racism while speaking to a racially exclusive group. Did that occur to anybody in the audience, that that was a little bit ironic? CARLSON: Well sure. I'm not attacking the journalists [indecipherable], I'm just saying if Donald Trump spoke to the white journalist association, people would say “whoa, whoa, wait a second now.” Why should journalists coalesce around a racial identity? Isn’t their job to find the truth? VARELA: Yeah, no, but Tucker, Donald Trump was also invited. So, are you going to come to the belly of the beast? We are journalists. It’s not like we're not going to sit here and go -- Donald Trump was invited and he said no. CARLSON: Right. No, no, and I'm not fighting for Trump. I’m just saying, the group, it seems a little bit -- if you take three steps back, kind of a little odd. The work of associations like NABJ and NAHJ is not anti-white; rather, these groups help young journalists of color find career opportunities and encourage the media to address blind spots induced by lack of diversity. The underrepresentation of minorities of color has been a recurring weak spot for both print and radio newsrooms over the past 20 years. The lack of voices of people of color in newsrooms can lead to inaccurate representations of reality, with media often overlooking important angles, privileging one-sided stories, or failing to provide necessary context to understand news events. This kind of inaccurate storytelling has the harmful impact of perpetuating racially biased public perceptions, like criminalizing youth of color or failing to give victims of color humane coverage. Right-wing media figures are blaming MoveOn.org for violence that occurred following Republican presidential front-runner Donald Trump's canceled rally in Chicago on March 11, likening the group to the Ku Klux Klan and accusing them of "creating this havoc and ... putting innocent people's lives in jeopardy." In fact, several media figures have slammed Trump for condoning "violence in rally after rally," and at the Chicago event MoveOn.org only helped provide logistical support for the protests, including printing signs and recruiting attendees. Ben Carson Praises Fox & Friends: "You're Some Of The Good Media"
Wash. Post: GOP "Should Be Mortified By The Face Of Their Environmental Leadership"
Sen. Jim Inhofe's (R-OK) embarrassing attempt to disprove global warming with a single snowball was rightfully dismissed by the mainstream media -- but it was applauded on Fox News. Other media outlets had a different take on the issue. New York Magazine's Jonathan Chait called Inhofe's argument "breathtakingly devoid of a factual or logical grasp of its subject matter." On the March 2 edition of The View, conservative co-host Nicole Wallace described Inhofe's action on the Senate floor as "moronic," adding: "if we want to get people younger than him to join our party I think it's time to stop denying and just say let's debate the solutions." The Washington Post editorial board wrote that the stunt shows how Inhofe's position as chair for the Environment and Public Works Committee is a "national embarrassment," adding: "The Republican Party should be mortified by the face of their environmental leadership." Originalmente publicado en inglés por Eric Hananoki y traducido al español por el staff de Media Matters. Fox News está presentando a Libre Initiative, el grupo patrocinado por los multimillonarios hermanos Koch, como una organización comunitaria fundada para "empoderar Hispanos" y avanzar "las libertades y la prosperidad". En realidad, el grupo insta a los Hispanos a que apoyen políticas públicas que según expertos, "van contra sus propios intereses" y "privan de derechos a los votantes Hispanos". La Libre Initiative fue fundada en 2011 y supone ser una "organización comunitaria, no partidista, y sin fines de lucro, que promueve los principios y valores de la libertad económica para empoderar a la comunidad hispana de EE.UU." El grupo tiene "presencia en ocho estados" y "planea expandirse hacia Wisconsin y North Carolina este año, además de incrementar su equipo en un 30 por ciento antes de 2016." Fox ha pintado al grupo como el producto de "una coalición de organizaciones de liderazgo hispano." Pero el equipo de Libre está conformado por veteranos del partido republicano, y han recibido más de $10 millones en fondos de parte de los multimillonarios petroleros Charles y David Koch. Libre ha admitido que su mensaje "se alinea mejor con los Republicanos" y "con los principios e ideas de Charles y David Koch." El grupo promueve la agenda de gente como los Koch a costa de los hispanos. Libre se opone al Affordable Care Act (ACA por sus siglas en inglés, también conocido como Obamacare), que le ayuda a los hispanos a conseguir seguro de salud. Se oponen a un incremento federal del salario mínimo, que le ayudaría a más de 6.7 millones de hispanos. Apoyan leyes de identificación electoral que sirven para "privar a votantes hispanos de su derecho al voto." Han acompañado a Fox News a empujar desinformación sobre los "ilegales" y la inmigración. Libre también ha hecho campaña en contra de políticos que apoyan una reforma migratoria, debido al apoyo que estos políticos han manifestado a favor de Obamacare. Fox Presenta A Libre Como Representando y Empoderando A "La Comunidad Hispana"
Expertos: Libre Está "Tratando De Hacer Que La Gente Vote En Contra De Sus Propios Intereses"
Fox News is passing off the Koch-funded Libre Initiative as a grassroots organization founded "to empower Hispanics" and advance "liberty, freedom and prosperity." In reality, the group urges Hispanics to support policies that experts say go "against their own interests" and "disenfranchise Hispanic voters." The Libre Initiative was founded in 2011 and claims to be a "non-partisan, non-profit grassroots organization that advances the principles and values of economic freedom to empower the U.S. Hispanic community." The group "has a presence in eight states" and "plans to expand to Wisconsin and North Carolina this year and increase its staff by about 30 percent ahead of 2016." Fox has portrayed the group as the product of "a coalition of Hispanic leadership organizations." But Libre is staffed by veteran Republican operatives, and the group has received over $10 million in funding from oil billionaires Charles and David Koch. Libre has admitted its message "aligns more with Republicans" and "with the principles and ideas of Charles and David Koch." The group promotes the agenda of people like the Kochs at the expense of Hispanics. Libre opposes the Affordable Care Act (ACA), which helps Hispanics get health insurance. They oppose a federal minimum wage increase, which would help more than 6.7 million Hispanics. They support voter ID laws that serve "to disenfranchise Hispanic voters." They've joined Fox News in pushing misinformation about "illegals" and immigration. Libre has also campaigned against politicians that support immigration reform due to those politicians' support of the Affordable Care Act. Fox Presents Libre As Representing And Empowering "The Hispanic Community"
Experts: Libre Is "Trying To Get People To Vote Against Their Self-Interests"
Fox's Carlson: "There Really Is No Such Thing As An Assault Weapon"
Fox Host: Having Kids Out Of Wedlock Is "The Ultimate In Negligence"
Fox News excitedly reported on new smart gun technology that increases firearm lethality through improved target accuracy, enthusiasm that stands in stark contrast to the network's earlier criticism of smart gun technology aimed at increasing gun safety. The TrackingPoint rifle, a new smart gun that debuted last summer from a startup gun company in Texas, uses lasers and computers to increase shot accuracy, enabling even novice shooters to hit a target over 1,000 yards away. The technology has been criticized for decreasing gun safety by making it easier for a criminal, murderer, or terrorist to kill from a distance without detection. Now novice shooters have the ability to hit a target from 1,000 yards away, a distance experts say only a handful of highly trained shooters can normally hit. Such safety concerns didn't stop Fox News from championing the smart aim technology and even sending one of their own hosts to try it out. Right-wing media are heaping praise upon Milwaukee County Sheriff David A. Clarke Jr. over his remarks at the National Rifle Association's annual meeting, ignoring his association with extremists. Clarke has drawn praise from conservative pundits for a speech at the NRA's annual meeting where he proposed that the words "keep your hands off our guns dammit" be appended to the Second Amendment. On Fox & Friends Saturday, co-host Anna Kooiman said Clarke delivered a "very powerful speech," while co-host Tucker Carlson said he was going to send Clarke fan mail, rated his speech "awesome," and fist-pumped as Fox's Peter Johnson Jr. said Clarke "put it out there in straight language that people can understand." On April 28, Clarke joined Fox & Friends for a laudatory interview that co-host Steve Doocy introduced by saying, "He is one law enforcement officer doing more than protecting you on the streets, he's standing up for all of our constitutional rights as well."